Ribollita, a hearty bread and vegetable soup, is a popular Tuscan dish served in many restaurants. There are many variations to this soup but commonly, it consists of bread, kale, cannelloni beans, potatoes, carrots, and onions. It is best served reheated the day after being made. 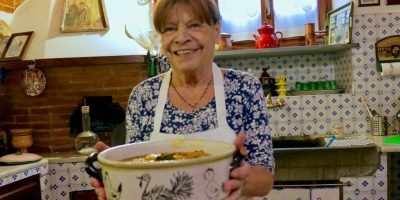 Here’s a video by the pasta grannies making ribollita.